Coutale, a blend of 80 percent Malbec and 20 percent Merlot, is a rich, flavorful wine with a smooth, lingering finish. It also is imported by one of the top wine merchants in the world. If you don’t know about an imported wine or its producer, one way to ensure that it’s a good buy is to look on the label for the company that brought it to our shores. Wines imported by Kermit Lynch are a safe choice. He has built a strong reputation during more than four decades of selling excellent, small-vineyard wines from France and Italy. Lynch, too, seems like a pretty interesting guy. He is a singer-songwriter, winemaker and award-winning author, and when he decided to open a wine store in 1972, he was surviving as a hippie rock musician living in Berkeley, Calif. There are a number of successful rock musicians who have their names on bottles of wine, but not many, if any, who have Lynch’s skill and depth of knowledge. Largely because of a staunch belief in terroir — that food and wine are influenced by the climate and soil where the ingredients are grown — Lynch became a key figure in creating the Bay Area’s Slow Food movement, a recent article in Food & Wine magazine says. Kermit Lynch Wine Merchant opened a year after and a few blocks away from the famed Chez Panisse. Founded by Lynch’s friend Alice Waters, Chez Panisse started the national trend of serving food cooked from seasonal, locally sourced and organic ingredients. To start his business, Lynch borrowed $5,000, rented a storefront in Berkeley and opened the doors with 35 cases of wine stacked on the floor. He went on to become a national distributor and importer of wines that are good representatives of terroir. “Kermit Lynch Wine Merchant started as a retail shop, but I grew more and more attracted by the Old World wine cultures of Europe. I obtained an import permit and decided to specialize in authentic, artisanal wines from Italy and France,” Lynch said in a recent newsletter. In the late 1980s and 1990s, Lynch objected to the Bureau of Alcohol, Tobacco and Firearms requirement that wine labels had to include the Surgeon General’s warning against the consumption of alcohol. He felt that labels also should include a countering statement about the benefits of wine. On a number of occasions, he petitioned the BATF to include quotes from Louis Pasteur on the hygienic properties of wine, the Bible on the healing properties of wine and Thomas Jefferson on the pleasures of drinking wine, Karen MacNeil wrote in the Wine Bible. Lynch’s persistence paid off in 1992, when the BATF relented and allowed him to include the Jefferson quote on every bottle he imported. Lynch also is credited with developing refrigerated shipping containers to ensure that after spending months at sea, the wines he purchased in Italy and France arrived fresh and tasting the same in the U.S. The containers are now the standard for the import industry. Cahors, where Coutale is grown and produced, is a small former Roman town about 100 miles east of Bordeaux that is contained on three sides by an oxbow in the Lot River. 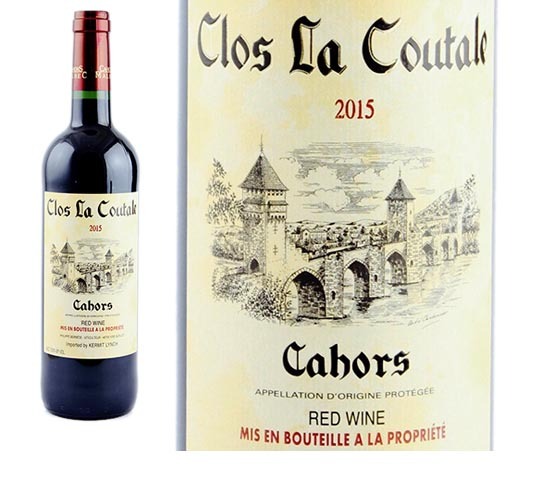 Since 1956, when vines were replanted after a devastating frost, the town’s farmers have grown primarily Malbec grapes, also called Cot, which produce the “black wines” of Cahors. Coutale is produced by winemaker Philippe Bernede, whose family has been making wine for six generations. With the 80 percent Malbec blend, Bernede has developed a tender and fruity wine that pairs well with fried seafood and with eggplant and tomato dishes. My wife, Sandy, and I had Coutale with a rich chicken, mushroom and artichoke dish that was a superb match. Clos La Coutale is widely available, but if you can’t find it, ask your wine store to order it for you. It will only take a few days, and if you’re a Malbec fan, it’s worth the wait. This is a terrific wine at a great price, that occasionally goes on sale for $1 or $2 off.